I tapped trees today, and Lisa planted the first seeds under lights. The 2010 farming year has begun. 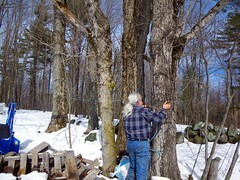 It was a beautiful day and the sap was running hard. I, of course, couldn’t find the actual taps, so we had to drive to Bascom’s to buy some, with the result that I’ll be lucky to get everything tapped tomorrow. Meanwhile, Lisa planted celery, celeriac, parsley, peas and leeks in reused plug trays from our ornamental years. Unfortunately both the horses and pigs have turned into total brats and are busting out multiple times per day. I know what to do for the horses, but can’t get to it until Friday. The pigs, I have to figure it out before I can do anything. In both cases an easy fix without snow will be a painful kludge with the fence frozen to the ground. Still, we’re farming again. Happy New Year. This entry was posted in Fencing, Horses, maple syrup, Pigs, Seed Starting. Bookmark the permalink. Post a comment or leave a trackback: Trackback URL.